You still see a lot of these 1960s-70s Slavias popping up at gun shows and swaps, usually for around $35 or so. Most of them have dried out seals, and don’t shoot well on account of that, so the owners toss them into a drawer and forget about them. This example was given to me by a friend, and as I expected, it didn’t have much oomph to it. That’s because the airguns of this era usually had leather seals, and leather seals need proper lubrication to keep them from drying out. And indeed, the breech seal on this gun was pretty dry, and the lackluster shooting behavior suggested the piston seal was in the same condition. Now if you’ve read the Basic Airgun Maintenance pages at this site (see the upper right hand corner of this page) you’ll know that despite what Bob Beeman says, there is no need to keep squirting silicone oil into the chamber of your modern synthetic sealed airgun every time you open a new tin of pellets. However… if you have a gun with leather seals, that’s exactly what you should do. I fished my old Beeman silicone chamber oil and spring lube out from my tool box, and started by giving the breech seal a good soaking. Next, I removed the chamber end cap- it screws right off- and gave the spring a few drops of spring oil. Following that, I put several drops of silicone oil right into the chamber, to replenish the oil in the piston seal. And last, I reattached the end cap, with the help of my home made spring compressor. Result: The gun shoots much more smoothly as well as noticeably stronger. I haven’t chronographed it yet, but perhaps I’ll get to that after some other restoration work. There are a few other details that still need attention: The bluing is worn, and there rust on the steel; the wood is obviously in need of refinishing; and the rear sight is missing the elevation ramp- I think I have a spare I can slide under there. I’ll feature this gun again when the work is complete. 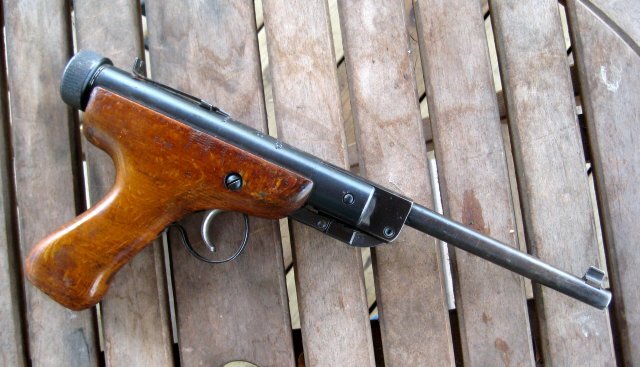 Update: Here’s an excellent airgun blog with an emphasis on airgunsmithing featuring the ZVP. This was written by mje. Posted on Tuesday, April 28, 2009, at 1:49 pm. Filed under History, Tests and Reviews. Bookmark the permalink. Follow comments here with the RSS feed. Post a comment or leave a trackback. The rear sght should be tapped for an elevation thumbscrew rather than using a ramp. The rear sight on this one is slotted for a ramp. Perhaps it’s not original? I searched for images of ZVPs, but couldn’t find one with a clear image of the rear sight. It may be that both types were fitted. Interesting. There were variations in the front sight design, so it’s possible that there were in the rear as well. Or it’s a retrofit. Often there’s no good answer. My rear site has a elevation thumbscrew. Having a little problem getting the leather seal back in shape. Anyone know of a parts site for the ZVP. howdy, where can i get parts for a model Slavia ZVP ? i have a very nice example of the zvp ser#08836 wondering what year it may be? I have a complete functioning ZVP s/n 91464, Fully functional, make me an offer and I will Parkerize the metal and refinish the wood. I am already Parkerizing 2 other guns, might as well throw this one in too. I just picked up one of these ZVP’s at a local show. My serial no. is 00189. From everything I have read, this seems to be a very early model. Only has one buggered up screw head, but is easily fixed. Gun shoots fine, but does need to be cleaned. Seals seem to be fairly tight and is quite accurate. Can anyone shed any light on this pistol.